Priscillas: De-Christmasing And Winterizing ! Good Morning ! I have been kind of slow this year putting away all the Christmas decorations .. I just wasn't ready for my favorite time of year to be over ! My big chalkboard in the kitchen has been winterized ! Don't you love it ! I will be back tomorrow to show you my Winter Kitchen ! The big ( real ) tree is coming down today , garbage day is tomorrow and I wanted to enjoy it for all the days I could ! I always keep up 2 trees for the month of January , Can't just go cold -turkey treeless ! This year I kept up the owl tree on the stairs and the snowman tree in the family room . 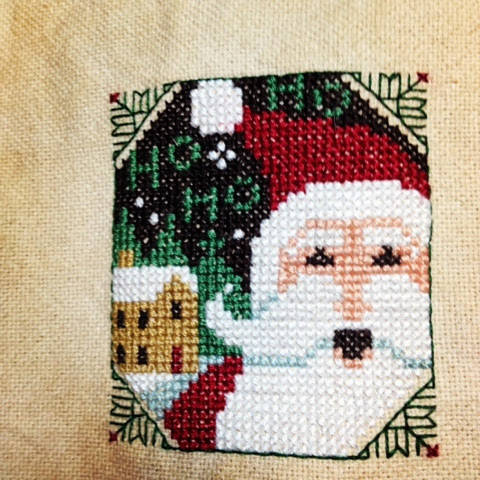 My first cross stitch ornament for 2014 , of course its Prairie Schooler ( there's a lot of stitches in that little ornament !! We have had so much snow this past week , 18 inches in a 2 day period , and now it is going to be -17 tonight and -14 for the high tomorrow ! A lot of schools around here are closing ! Hope you stay warm ! Stop back by tomorrow to see my winter kitchen ! already a new ornie!! You go girl! I also leave my small snowman tree up through the end of January--it just brightens up my kitchen during a very dull month!! Stay warm now--sounds like you guys are really getting hit out there in IL! But then you can start planning for next year! 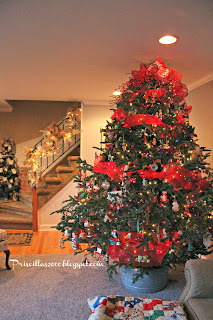 Its such a shame to take down the decorations, the home always looks so bare. Love your ornament, looks familiar!!!! Wow that's a lot of snow!! I am sad as I am taking a little break from taking down all my decorations. Putting everything in their proper boxes as tomorrow a friend of mine son is going take the boxes out to the garage and straighten it out as it is one BIG mess. Your right, everything is so bare and un-feastive, but will start thinking about spring. We're still Christmas-ing here too. the tree will come down Tuesday as Wednesday is the garbage day. We cut it down on black Friday and it's been up ever since. 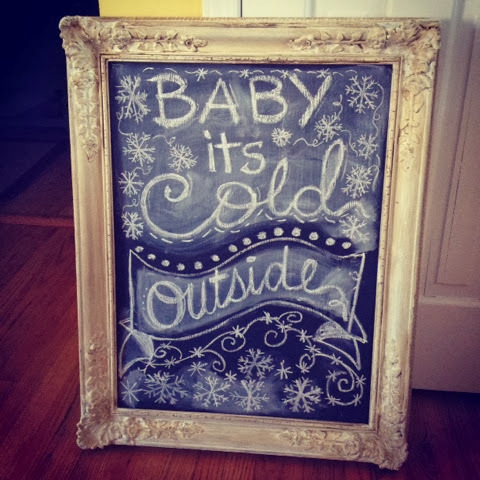 Love your chalkboard,,,time to re do my message on mine that I have in the entry...I think "Baby its Cold Outside" will be perfect! Stay warm! I agree, we still have our fake tree up! We are still enjoying it too much to take down. 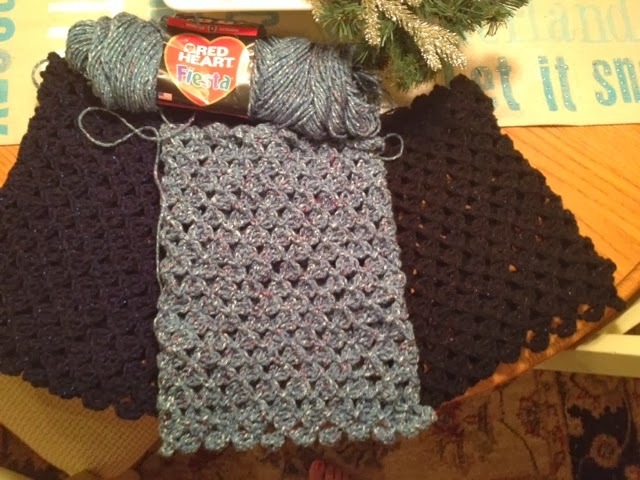 I am looking forward to seeing how you decorate for winter! Please stay warm!!! We have been hearing about the very cold temps!!! It is pretty nice here if you like rain! I've been de-Christmas-ing this weekend too... the house looks so empty with all the holiday stuff put away. I loved your chalkboard - so cute! and your cross-stitched ornament is adorable. It's been a while since I've done any cross-stitching, but it is fun and relaxing to do, isn't it? 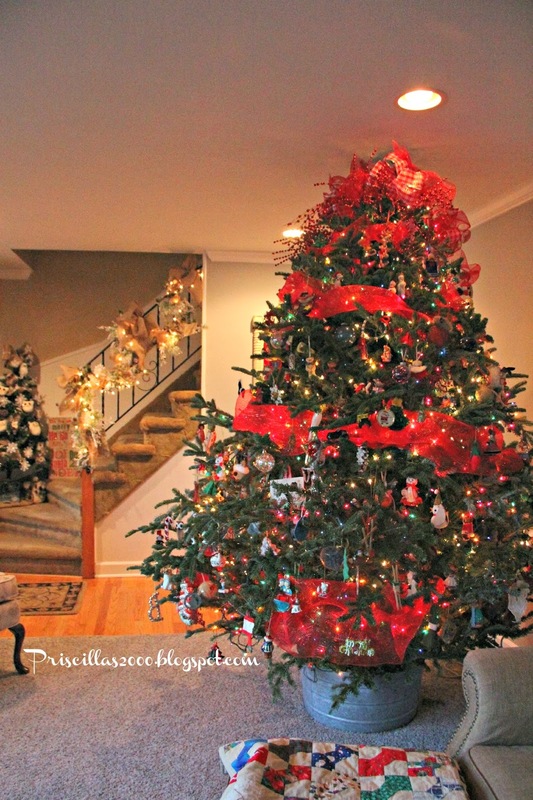 I always have trees up year round and decorated. I guess i just can't let go of that glo from a tree at Christmas. I wanted to tell you that your home was stunning this year. I visited but I didn't have a lot of time to comment but I adored all your spectacular trees!! *swoon*... love the gold frame!... xo! Priscilla, I love the chalkboard! Mine says the same saying, but not nearly as elaborately. lol! I drew three simple snowflakes. Love the new ornament! Thanks for sharing with SYC.